After looking again at the map, why is 69 marked as the Great River Road? That symbol s/b on US61 instead. It's a mystery as to why they would move it back to the 2000 location for the 2012 map. Perhaps it was moved in postproduction in 2011, and the files they updated for 2012 had it in the old location. Also of note is that the map does not show I-269 (I-69 SIU 9b) construction. The MDOT representative asked me if I might be able to help with the upload (I do not have that ability). If anyone wants to assist MDOT, give 'em a call. Mississippi disagrees wrt I-69 at I-55. I-55 has C/D lanes and the interchange is much newer (with, I believe, less tight ramps); plus the likely directional split of traffic is different, you have a much later design year in play, and when FHWA signed off on the interchange, the loop routing for I-69 proper via SIU 9 was still a possibility. PS: I-69 was built with a cloverleaf loop at I-55 in Mississippi. There's no reason the one in Kentucky can't stay. PPS: that was designed and construction began before I-69 was approved. PPPS: so was the cloverleaf in Kentucky. The Texas Transportation Commission has given final approval to designation of an additional 28.4 miles of US 59 as part of Interstate 69. 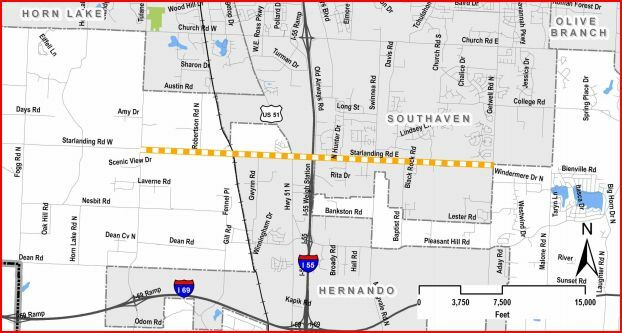 The existing section of US 59 from the south side of Rosenberg in Fort Bend County north to Loop 610 in southwest Houston is now part of the Interstate Highway System and will soon be signed as both I-69 and US 59 .... There were five design issues identified and exceptions were approved by FHWA. Q: Driving northward on I-69 SIU 10 in Mississippi, one has to take a loop ramp to keep proceeding northward on I-69 SIU 9a (I-55/I-69). Did FHWA allow this as a permanent design exception for I-69, or has MDOT made a commitment to upgrade the interchange at some point in the future? A: The email we received pertains to the design of the I-69 interchange with I-55. Specifically, you asked about the loop ramp from I-69 to I-55 north. The interchange was designed to accommodate the projected traffic and in accordance with the current design standards as published by the American Association of State Highway and Transportation Officials (AASHTO). Therefore, no design exceptions were necessary for the subject loop ramp. Q: I do have a follow-up question. As I understand it, the interchange was designed before the I-69 routing was finalized, which I assume means that there was no need at that time for it to meet FHWA interstate standards and that is why AASHTO design standards were sufficient. If that interchange were to be built today knowing that it was on the routing of I-69, then would FHWA interstate standards require a flyover ramp in order to keep I-69 from exiting onto itself? If so, would a design exception based on projected traffic then be necessary today to keep traffic on the loop ramp? A: In reference to your follow-up question, the interchange was designed to accommodate the projected traffic and in accordance with AASHTO design standards. Furthermore, based on current AASHTO guidance no design exceptions are necessary today for interchange type selection. Since FHWA must certify that a route meets interstate standards before it can receive an interstate designation, I had always thought that FHWA had its own interstate guidelines. The above responses imply that FHWA applies AASHTO guidelines. To keep this with the thread title, it doesn't seem like there's any changes between last year's and this year's I-69 route. Interestingly, they don't show the AASHTO-approved continuation of I-69 north into TN along I-55, I-240, and I-40, but TN has not yet signed that continuation, either. 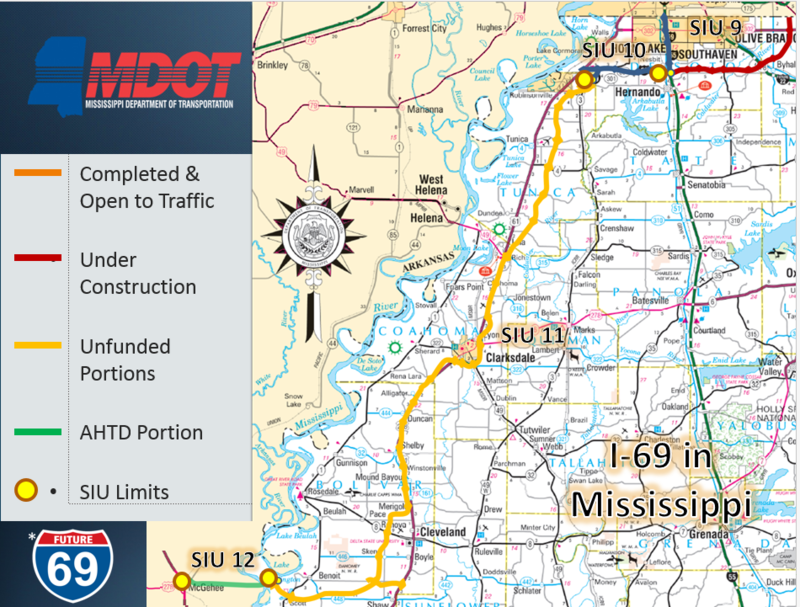 By showing that the I-69 part of SIU 9 and all of SIU 10 are completed (there appears to be a color mismatch for "Completed & Open to Traffic"), that all of the I-269 part of SIU 9 is under construction, and that SIU 12 is primarily in Arkansas, the Mississippi delegation may have been able to put together a relatively persuasive argument that Mississippi has made good progress on I-69 and that it is deserving of Congressional assistance for SIU 11. More food for thought for the next long-term highway reauthorization. And unless Congress gets back into the earmarking business and "appropriator" stops being a dirty word in DC, the best MDOT can really hope for is getting some design plans and ROW together and winning a federal "shovel ready" grant or two during the next recession, particularly given SIU 11 is almost entirely in a solidly Democratic congressional district that has no pull in Congress these days. SIU 11 seems to consist of several sections of independent utility, both online upgrades of US61 to bypasses. This video/ article reports on a recent speech that Mississippi U. S. Senator Roger Wicker gave to the Delta Council in which he touted as an "accomplishment" the "longer term work that will eventually lead to the completion of Interstate 69 through the Mississippi Delta"
The recent introduction of a long-term highway bill is welcome news for communities across the country. Enactment of a comprehensive, strategic transportation plan would give state and local leaders more certainty to invest in critical upgrades to aging roads and bridges. It also promises to pave the way for much-needed economic growth and job creation. Titled the “Developing a Reliable and Innovative Vision for the Economy (DRIVE) Act,” the bipartisan highway legislation could not come at a more opportune time. Unless Congress acts, federal highway funding is set to expire at the end of July. Since the last long-term transportation bill expired in 2009, Congress has passed dozens of temporary funding extensions. Rather than offering another quick fix, the DRIVE Act would authorize highway funds for the next six years. Both political parties recognize the importance of a high-quality transportation system and the role it plays in the well-being of our economy. The DRIVE Act earned approval from every member of the Senate EPW Committee. It now awaits consideration by the Commerce, Finance, and Banking committees before it can come to the Senate floor. National policies should reflect current challenges, and surface transportation is no exception. Poor infrastructure and congestion affect Americans’ everyday lives in profound ways, from the commute to work to the prices at the grocery store. It is past time for a transportation bill that truly invests in our country’s long-term success. I skimmed the text of the bill and there's $2 billion dollars set aside in 2016, going up to $2.5 billion in 2021 for projects to upgrade the National Freight Network. The definition of what's eligible for funding seems pretty broad though. There's also a pool of money for "assistance for major projects (that would cost over $350 million)" that starts at $300 million and ends at $450 million in 2021. The min. federal grant is $50 million. Of course, the problem is actually funding the program and other committees are the ones handling that. Will we ever see any more of Interstate 69 in Mississippi constructed within our lifetimes? I think the Cleveland bypass has a good chance of being let in the next decade. It's one of the few good-sized towns in the state that doesn't have any sort of bypass already, and I don't think building it would be all that expensive (cheap land, not much topography to deal with, only a few interchanges and overpasses needed). The plans include a spur back to US 61 which I think MDOT plans to extend further southeast to US 82 at US 49W at some point. If AHTD gets to work on the route east of Monticello it'd probably spur some action in Mississippi too; AHTD might be motivated by improving access to a big defense contractor in Camden which isn't far from the I-69 route. 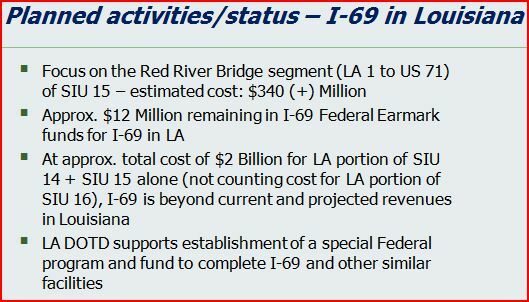 Several years ago, it looked like completing I-69 to Tunica was the highest prioritized section. I do not know if that is still the case. early studies for the Star Landing project envision ... a landscaped parkway of 22 miles, capped by a diamond-type interchange at I-55. Nail Rd and Star Landing Rd intersect I-55/69, not I-269. 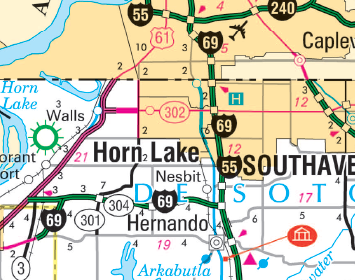 A long-sought McIngvale interstate exit at Hernando may be just around the corner, said Mississippi Northern District Transportation Commissioner Mike Tagert. "It's possible within the next year" that a state and federal go-ahead could arrive, said Tagert. And the needs don't stop at McIngvale. Horn Lake Mayor Allen Latimer said, "What I'd also like to see is an interchange on Nail Road and for Starlanding. With all the development going on, this will help Southaven as well as Horn Lake to relieve congestion." Maybe construction of an interchange will be coordinated with the widening construction. ... the idea of an interstate interchange at Nail Road and I-55 that would come in just to the South of Southaven Towne Center. 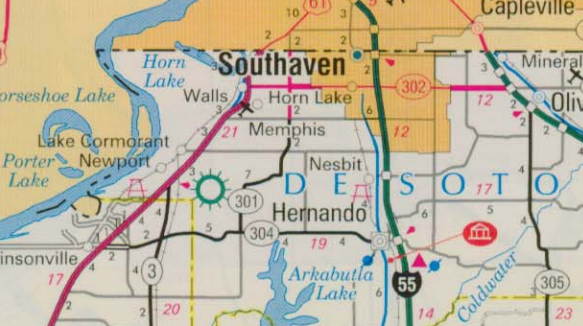 Not only would it bring new traffic, and potentially more business to Horn Lake and Southaven, it would also connect Nail that’s split by I-55. Transportation officials say Nail Road sits too close to Goodman, about a half mile to the north, and Church, about a mile to the south, and the three interchanges would sit too close together. Mississippi Transportation leaders say they don’t have the money, and there’s no way the Federal Highway Administration will pay for it. Horn Lake Mayor Allen Latimer says it’s a critical project for his city. ”It is a major economic development issue with us." DeSoto leaders say they don’t intend to give up their pursuit of the project. I think a Nail Road interchange would certainly be lower in priority than a Star Landing interchange. The only way a full interchange at Nail Road is viable is with a C/D setup. Maybe something south-facing only would work, but I'd imagine most of the traffic that would want to get on/off at Nail (to access the shopping center east of I-55 without dealing with Goodman Road/SR 302 traffic) is from the north. And that would be ridiculously expensive and too late to include in whatever widening is planned for Real Soon Now. Mississippi plans to widen Interstate 55 in Southaven to 10 lanes and build a new interchange to serve the Tanger regional mall going up at Church Road. Southaven Mayor Darren Musselwhite has said widening I-55 and building a new interchange could cost about $160 million, although highway engineers have not yet released a final estimate, said Jason Scott, spokesman for the Mississippi Department of Transportation. The freeway presently is six to eight lanes in Memphis between Interstate 240 and Southaven, and up to 10 lanes in Southaven up to Goodman Road, where it becomes four lanes. South of Church the freeway would remain four lanes. I-269 intersects I-55 about five miles south of Church. I-269 is the outer loop being built 24 miles across the suburban Mississippi counties to connect with Tenn. 385 at Collierville. The Mississippi portion is scheduled for completion in 2018. I wonder if MDOT even considered a possible frontage road option for this project several years ago? I didn't think it was very long that the current I-55/Goodman Road interchange was built in Southaven. There should have already been a project to widen I-55 from there to Hwy. 305/I-69 long ago. the area of Highway 61 Clarksdale wants to annex, which includes Shady Nook, is attractive to the city because of the potential development of Interstate 69. But Mills noted that development of I-69 isn’t going to occur without any frontage roads. He added that Vassel testified he didn’t think he’d see the development of that interstate this far south during his lifetime. As the city attorney for Ridgeland and Byrum, Mills said that experience “gives me a good base for how cities should operate.” “Clarksdale has problems larger than any municipality I’ve worked for or against,” Mills said. “One of the things we’re going to be putting on is the rate of decline in Clarksdale is related to out-migration.” He said Clarksdale has a higher rate of births than deaths, and therefore, the decline in population is due to people leaving the city. In the years between census population counts, the US Census Bureau estimates population annually, and Mills said in 2014, they estimated Clarksdale'’s population to be right at 17,011 people, which Mills said would reflect a 900-person decline in four years. “At that rate, Clarksdale is losing 4 ½ people a week,” Mills said. As the city and county go back and forth, call witnesses, crunch numbers and provide boxes of exhibits and evidence to support their claims, Mills said that “Lyon is in the fight of its life” during this trial. Mills also offered his opinion on the case as a whole. “My assessment of this case is that Clarkdale is attempting to annex its way to prosperity, and it can’t be done,” Mills said. Clarksdale appears to be in a slow decline and is hoping that Future I-69 can at least slow the decline. * This timetable is probably broken until Mississippi can find a way to increase its transportation funding. Horn Lake Mayor Allen Latimer said, "What I'd also like to see is an interchange on Nail Road and for Starlanding. “The large-scale project is widening I-55 from Church to just south of Goodman. As part of that project we are going to rework the interchange at I-55 and Church,” Scott said. “One possible option is a cloverleaf with a loop inside the cloverleaf at the southeast quadrant of the interchange. Supervisor Gardner said the two-day meeting last week in Washington was "very productive." He and Supervisor Lee Caldwell of Nesbit, and county consultants, including Tracy Huffman of the Waggoner engineering firm, met with U.S. Rep. Trent Kelly, U.S. Sens. Roger Wicker and Thad Cochran, all R-Miss., plus Corps of Engineers and federal Transportation staff, on road and stormwater/flooding issues. "We talked specifically about Holly Springs Road and Nail Road and Church Road interchanges," said Gardner. Funding is being sought to elevate flood-prone Holly Springs Road, a major east-west artery, and to handle rising traffic along Interstate 55, as I-69/269 links are being completed. The "whirlwind" visit was complicated by problems at the D.C. airport what required diversion to Philadelphia, "and we had to catch a train to Washington," said Gardner. With the plans for the Church Road interchange having not been finalized, it appears that, although the Nail Road interchange may be on life support, Desoto County officials may still have time to keep it alive.